Wow, guys. Not only did the RPG kickstarter successfully fund since my last newspost... it's almost hit it's first stretch goal as well! You all are amazing. Thanks so much for your support! As you may have seen, I posted a big update on our kickstarter page on Monday about how character creation works in our game. It outlines the major components of our characters, and the core elements that make our game unique: our COPE and DEAL stats, and our extremely job influenced power and skill system. It also revealed our seven major playable species, along with some art of them from the book! And of course, at this rate, it looks like we'll be adding the squid folk of the Calamari Dynasty to that list shortly... and if things keep going well, maybe even the shapeshifters! It's all pretty exciting for me. I keep thinking of this Ninja Turtles RPG book I had as a kid. I didn't actually play tabletop games much yet at that time, but I loved pouring over it and learning about all these places and characters and groups from the... uh... turtleverse... that had never been dug into elsewhere. I want our book to provide that same kind of amusement to S&F fans, and I look forward to packing it with as much stuff as possible! As I write this post, the kickstarter for The Underground: A Sam and Fuzzy RPG is teetering at 99% funding. That, my friends, is bananas. I am thrilled to see so many of you are as excited about our game/guidebook to the Sam and Fuzzy universe as I am! The 20k expansion would introduce a massive helping of new Underground lore, detailing the twisted history of the Calamari Dynasty -- an original Committee member organization that was replaced by Squilt's Salmon Corporation and revived as a rival faction. If you've ever wondered what the deal is with all the squids running around in the comic... this is my chance to finally dig into it! And of course, both factions of squids would also become playable in game. 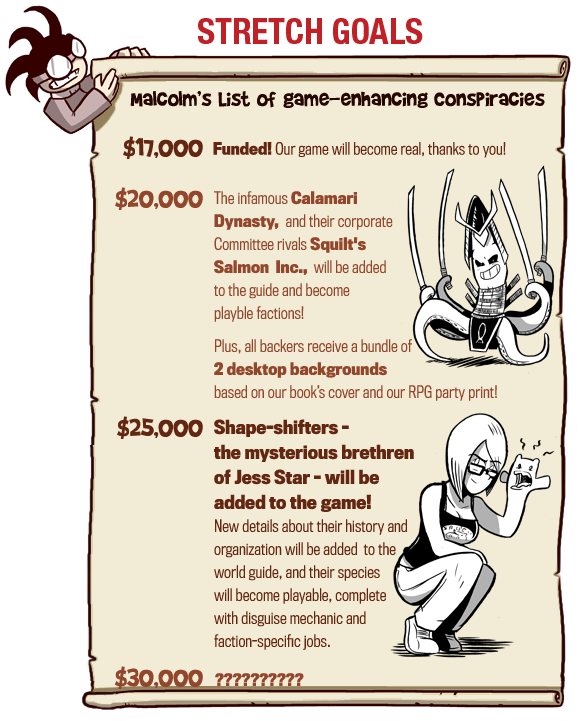 Meanwhile, the 25k expansion would reveal the truth about the brethren of Jess Star -- the mysterious shapeshifters! This is something I've wanted to explore for ages, but that just never fit logically into the comic story. In addition to becoming a playable species with a newly designed disguise mechanic, shapeshifters will also get a big write-up in the book's lore sections, detailing the secret history of their species, and which other Sam and Fuzzy character(s) are also secretly shapeshifters. You know, in case you were curious. Anyhow, we've got some fun ideas for additions! But that's not to downplay the quantity of stuff that's already in there. Late last Friday, I posted our book's working draft Table of Contents, to help give people some sense of the scope of the project. Allow me to reshare it here! And believe it or not, all that content is already written! (Although I'm still busy illustrating it and laying it all out in InDesign.) Right now, we're estimating it'll be around 250-300 pages in print form, with over 100 new illustrations crafted just for the book. We have been busy. We return on Wednesday, with a new comic and more info about the RPG project. See you then! will detail the twisted history of the Calamari Dynasty -- an original Committee member organization that was replaced by Squilt's Salmon Corporation and revived as a rival faction. First of all, guys... wow! I was pretty nervous going into this kickstarter. I knew it was a new genre for me, and even though I thought we'd put something pretty cool together, I wasn't sure if folks would be into it. But as of right now, our project is already 80% funded! That's amazing. Thanks so much for your support! I've gotten a lot of questions about the project, either through the AMA we did today or by email. So I thought I'd use today's Q & A to publically answer some of the more popular questions. That said, we think the rules of our game are sufficiently well explained that a GM could easily mod it to take place during other eras of the strip. For example, if you wanted the game to take place post Vampire exposure, you could... you'd just want to adjust the strangeness/quarantinability level of the vampire species to be the same as humans, rather than the same as other mid-range, "disguisable" inhumans. We'll talk more about specific stretch goals as we get closer to funding. I hate to start bringing them up too early, because even though we are doing really well, it just makes me feel like I'm being a little presumptuous! That said, I do think there is some room to expand the project in fun ways... even though it's already pretty big as is! All the most frequently appearing species from the comic -- humans, vampires, wolfpeople, sentient robots, Buddy Bears, grrbils and other sentient rodents, and Catopians -- are currently playable, but I'd like to add some of the more obscure ones as well if we get the chance. Like Jess' people, the shape-shifting slugs! That would let us work in a cool disguise mechanic we had brainstormed, and also give me a chance to flesh out more about them in the lore section. I'd also love to add a second sample campaign -- Shannon wrote a pretty amazing initial one, delving deep into the sinister history of SanPresto, and I'd love to do that again in a different corner of the S&F universe. And of course, we're also curious what kinds of things YOU would like to see in the game! We're going to start spilling on the current contents of the gamebook next week, and once we do, we'd love to hear what kinds of game and lore elements you'd be most interested in seeing added. Because The Underground RPG is set in the pre-Noosehead era, and focuses on establishing the state of the world, the Underground, and the various different species during that time period... as well as some of the history of how they all got to that point. 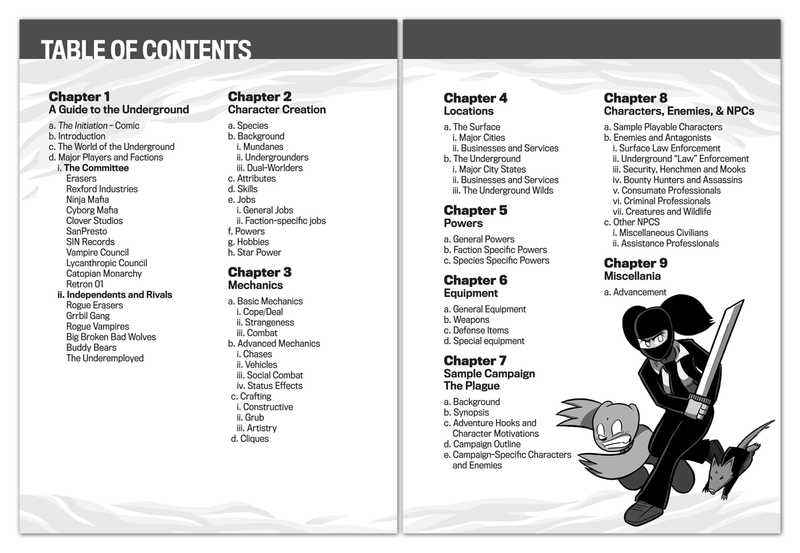 The first section of our book is dedicated to setting the stage the Sam and Fuzzy universe. After explaining what the Underground is, why it was created, and who enforces the divide, it is primarily a catalog of influential factions and players in the above and belowground worlds. It delves into many of the organizations and leaders included in the Committee, as well as many of the independent non-Committee rival powers. (Like the Grrbils, for example.) Many of these factions -- like the robots and wolfpeople -- have barely been explored in the actual comic. Others, like the Cyborg Mafia, are just explored in more detail. All right! That is a wrap for this week, my friends. Come back next week, which will bring both more comics and more info about the mechanics of our game project. Cheers!